The biggest obstacle to justice in a foreclosure is the reluctance to let someone get “a free house.” The most strongly voiced words in arguing against a foreclosure defendant, is that the person or family should not be given a free house. For instance, the issue of the original note and how the foreclosure plaintiff must have it or have the right to enforce it, is blunted by complexity. In contrast, “No free houses” comes from the gut, as forcibly as hunger. The hunger, however, is a type of greed. It wants, and what it wants most is for no one to have something it can’t have. A bank like Wells Fargo breaks its loan modification agreement, then racks up interest to grossly bloat mortgage debt by not allowing you to pay a reduced interest rate, even after having taken TARP funds that were supposedly meant for use in modifying loans. American families could have stayed in their homes if interest rates had been modified. A bank can say, “No free houses,” because on the bank knows that in our secret greed we agree. If we can’t have a free house, then no one should. Suddenly the foreclosure is not about the laws the bank as broken, like due process, the UCC statutes, the laws against perjury. 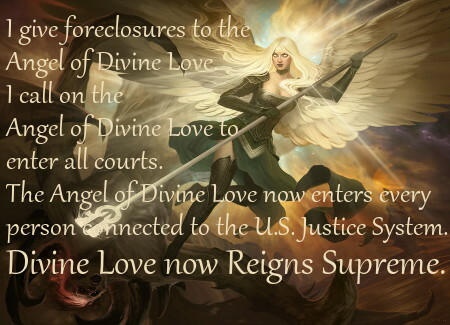 Suddenly, and convincingly, the foreclosure is about it not being fair to let someone have a home without having to continue paying the mortgage. In order to free our justice system from the chains we impose because of our unspoken but strongly felt greed, we must want the free house for someone, even when we don’t have one ourselves. Once we do that, courts will be able to see their way clear to hold banks accountable. Art Credit: Avacyn, The Angel of Hope by Howard Lyon Fine Art and Illustrator.